Gladwell is the calm in the storm. In slow motion we are able to grasp his skating ability - he was after all a champion skateboarder for Australia - as well as his ability to demonstrate the beauty in genuine and profound vulnerability. Gladwell was and continues to be fascinated with the slowing down of time and focusing on the beauty that exists in fleeting moments. In skateboarding culture, skaters will spend hours in front of a TV(or computer screen) playing footage in slow motion to learn and later execute various skateboarding techniques. Unsuspecting viewers are introduced to a standard practice of a particular subculture and offered the opportunity to cast a fresh eye over an ?other?. In the Silent, Ambient and Harder Remixes exhibition catalogue essay, Simon Rees rightly states the artist is wearing Turner-esque shaded clothes that are various shades of grey, which includes the heavy silver chain that sways back and forth with his every move. Not only does this work document contemporary skateboard fashion but it complements the stormy and sombre landscape in the background. Storm Sequence was dedicated to the artist?s skateboard trainer and close friend who died in the late 90?s, hence the interpretation of genuine and profound vulnerability. There is a great sadness that underlies this fabulous piece, yet it is peaceful and meditative. Gladwell is an intelligent, well read artist, interested in theories questioning the notion of public and private spaces and notions of the ?other? and this particular case, the ?sub?. 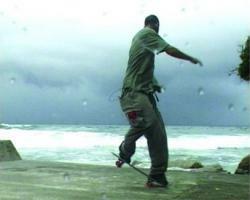 Storm Sequence, made in 2000, is one of a four part series comprised of; Storm Sequence, Kick flipping Flaneur, Tangara and Double Line Work. The work was commissioned by Peter Fay and has been the focus of many exhibitions in Sydney, Canberra, Perth, Beirut, New York and London. SHAUN GLADWELL Born 1972, Western Sydney Shaun Gladwell completed a bachelor of Visual Art (Hons) at the University of Sydney in 1996, followed by a Masters of Visual Art at the College of Fine Arts, University of New South Wales. In 2001, he was awarded a three-month Australia Council residency at the Cité International Des Arts, Paris. An Anne and Gordon Samstag International Scholarship enabled him to undertake associate research at Goldsmiths College, London (2001?02). During this time, he was included in the show, The Mind is a Horse, at Bloomberg Space, London. In 2002, Gladwell was commissioned to present a broadcast work for Netherlands TV network 4DTV and was included in Iain Borden?s first theoretical survey on skateboarding culture. Recent solo exhibitions include New Balance at Perth Institute of Contemporary Art (2004) and two Sherman Galleries? exhibitions, Silent, Ambient and Harder Remixes (2003) and MMXBREAKLESS SESSIONS (2005). Shaun Gladwell has been represented in important national and international group exhibitions, including Primavera 2003: Exhibition of Young Australian Artists, Museum of Contemporary Art, Sydney; 2004: Australian Culture Now, Australian Centre for the Moving Image (ACMI) and The Ian Potter Centre: NGV Australia, Melbourne; and, in 2005, the Anne Landa Art Award, Art Gallery of New South Wales, Sydney; Not Worried: New Art From Australia, Raid Projects, Los Angeles; New Acquisitions, Govett-Brewster Art Gallery, New Plymouth, NZ; and Space Invaders, Museum Kunsthaus Baselland, Basel, Switzerland. Shaun Gladwell is represented by Sherman Galleries, Sydney.